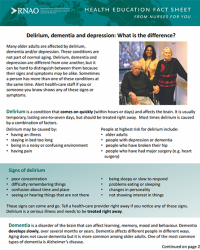 Delirium, dementia and depression: What is the difference? 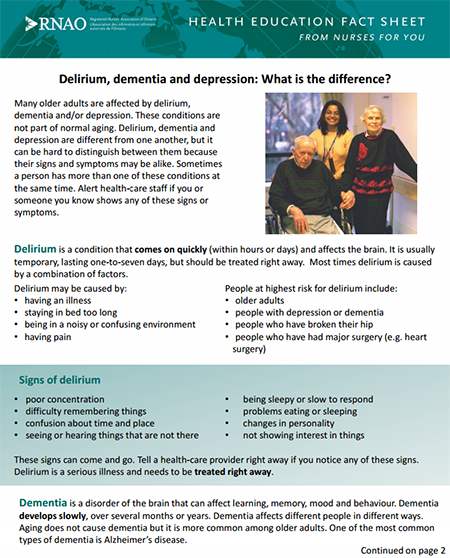 Many older adults are affected by delirium, dementia and/or depression. These conditions are not part of normal aging. Delirium, dementia and depression are different from one another, but it can be hard to distinguish between them because their signs and symptoms may be alike. Sometimes a person has more than one of these conditions at the same time. Alert health-care staff if you or someone you know shows any of these signs or symptoms.